Shares in Celsius Resources (ASX: CLA) are continuing to run on the back of extremely promising cobalt copper results released last week in relation to the group’s Opuwo project located in Namibia. The initial momentum arguably came from the first four holes drilled with the results highlighted below, however this has been backed up by further promising drill results released on Thursday. 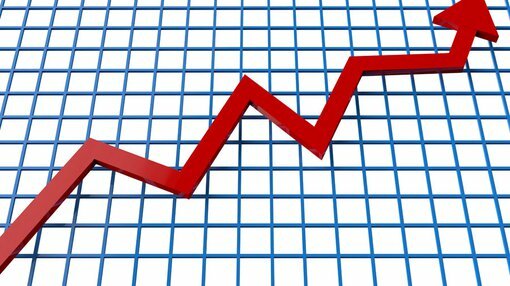 Providing some perspective regarding the company’s share price performance over the last week, the S&P/ASX 200 Materials index (XMJ) has only increased by 1.3%, while CLA has gained more than 20%, hitting an intraday high of 4.6 cents on Wednesday. As can be seen from the following strong assay results in the first four holes of CLA’s 20 hole program, including the substantially higher grade zones within those intersections, there appeared to be more promising news on the horizon. 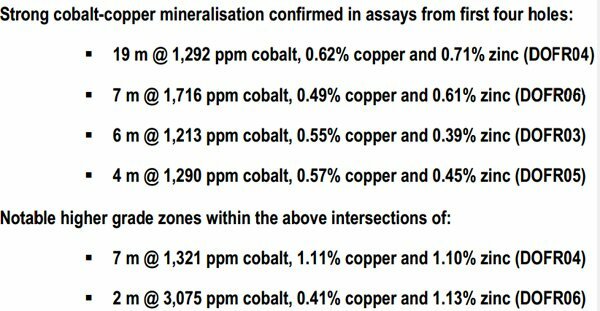 Results released on Thursday include impressive intercepts of 7 metres and 5 metres, both featuring grades of circa 1500 ppm cobalt. The fact that the company still has 11 holes left to drill with regular assay results to be released in May is perhaps the reason behind the strong share price momentum. The early outperformance in terms of grade and thickness against management’s expectations augurs well for the future. As CLA highlighted, the average grades and thicknesses are stronger than the two discovery holes drilled in 2015, providing a sense of optimism that a significant tonnage of cobalt, copper and zinc can be defined at Opuwo. On this note, CLA’s Managing Director and experienced campaigner in the cobalt/graphite space, Brendan Borg said, “The assay results from Opuwo continue to exceed our expectations and demonstrate that an extensive mineralised system is present at the project”. Drilling has commenced in the western sector of the project where the highest grades of cobalt were identified in surface samples and trenches. Diamond drilling will commence in early May, providing samples for first-pass metallurgical testing. The planned metallurgical studies, along with preliminary mining studies and resource definition drilling are expected to contribute to a Scoping Study for the project plan for completion before the end of 2017. Upcoming results from both initiatives should provide ample data for investors to gauge the likely Scoping Study scenario, potentially providing further share price upside.